So my birth mum lives in Somerset right? I got educated. Quite a lot of information really. Love having a Mensa member for a mother. I’ve been mulling the alleged late nights and drinking at inappropriate times of these high-level professional sportspeople over. Hence the delay in this post. So there was media outrage over the behavior of these two. Perhaps a little judgey but then again, perhaps not. I don’t get why they’d go out on a school night. I don’t get why they’d get trolleyed. I don’t get it because they’re supposedly professional athletes – tasked, focussed and on a mission. Supposedly. I feel for the Black Caps. They’ve done something remarkable in achieving a test victory over India. And all the talk is about Ryder and Bracewell. Both have been given multiple chances. Both are actually surplus to requirements now. We have depth. Cut them loose NZ Cricket. As an organisation you’re moving forward and this Black Caps unit is gelling well, and performing. The other players don’t need this distraction. So. 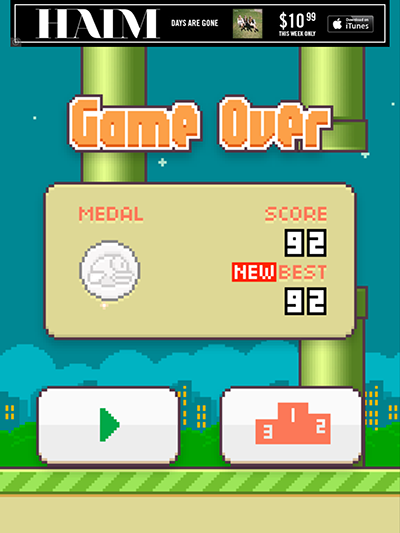 I gave in and downloaded Flappy Bird. Which, as you all now know is no longer available for whatever reason. Anyway, I was motivated to play this infernal game because my 11 year old son (with whom I am highly competitive when it comes to gaming) got 41 points. In about the same time I was on 14 points. And would you believe it? By the time I got to 41, he was on 74. 74!!! And he sent me a gloating text message to mock me. I called him to get the glory. He didn’t care. He’s moved on. Well. This was unexpected. I’ve had a pretty major emotional reaction that I am trying to get my head around. I’m grieving and reflecting. Backstory: My apartment is up for sale. This means I have had to get to to photo-ready cleanliness for the advertising, and then presentation-level cleanliness for the Open Homes. I keep my home tidy for the most part, so it’s not really a huge stretch. However it’s the first time I have had Open Homes forced upon me. Previous Open Homes in my life have been at my behest and I was a beneficiary of said Open Homes. Today was the first one. Hopefully, not the first of an endless stream of highly irritating inconveniences, but that depends entirely on the saleability of this place. One thing that has bothered me is that I have had strangers through my home. Uninvited strangers. I’ve been here for over 4 1/2 years. In that time my parents have visited twice. My older sister, once. My younger sister, once. People generally don’t visit. This is my sanctuary. It has become this for a number of reasons. It is my first ‘me’ place. A place that I made my own. A place that reflects my style and needs (rather than having to say ‘yes dear, you can do that style of decorating in that room’). This is a place that I have created to be safe and fun for my kids (when they come to stay). In this place I have healed, I have grown. In this place I have rediscovered ‘me’. People tell me that change leads to a better place. This is of course quite possible. However I suspect that change that I am not managing or in control of leads to upheaval and disruption. All this may be unnecessary and preemptive but one can’t control when grief hits. This place is way more than walls and a roof. There is a good chance that it’s purchased by an investor who likes the idea of me being here, in which case life goes on. Nonetheless, I have not been happy today.